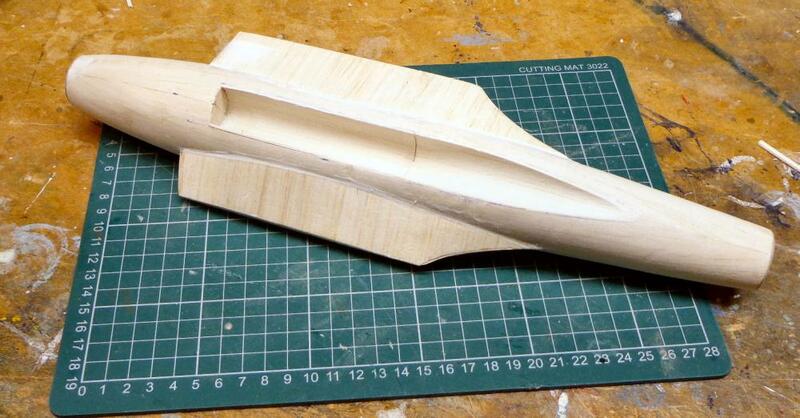 I have been slowly putting the air intakes/wing-fuselage fairings together. 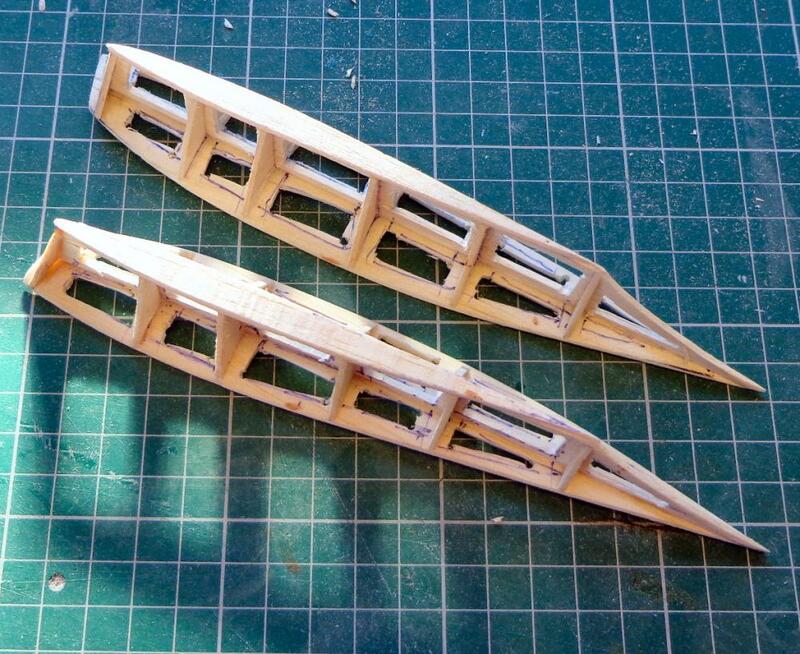 Like the fuselage, these are 1/16" balsa. The frame is 'medium-light' and the skin the lightest balsa I could find. 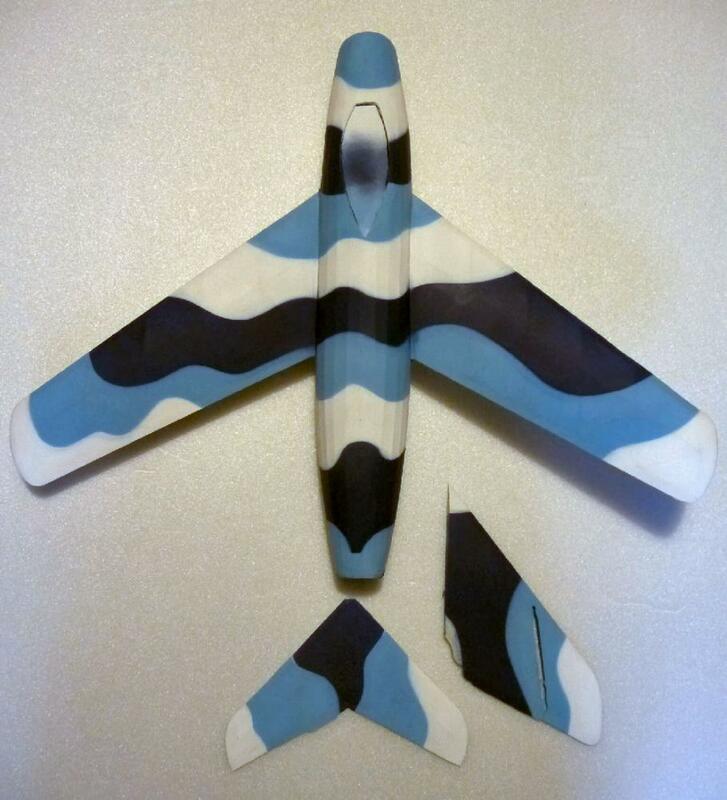 The templates were first moulded to the correct shape using the original fuselage moulds and the horizontal bit then attached, making sure it was all square and the two intakes match. The building sequence below should I hope be self explanatory. 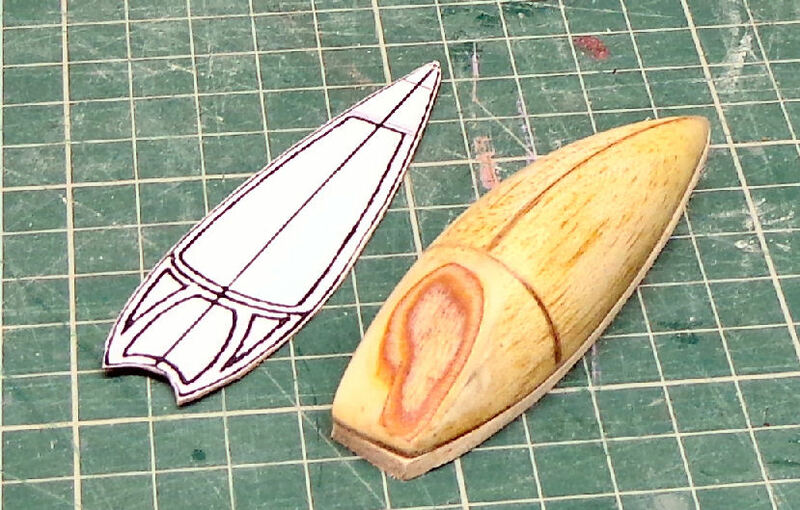 The cut outs to add lightness look 'orrible and only saved a gram, so I wonder if it was worth doing. The two finished intakes together weigh 6.2g, not too bad. 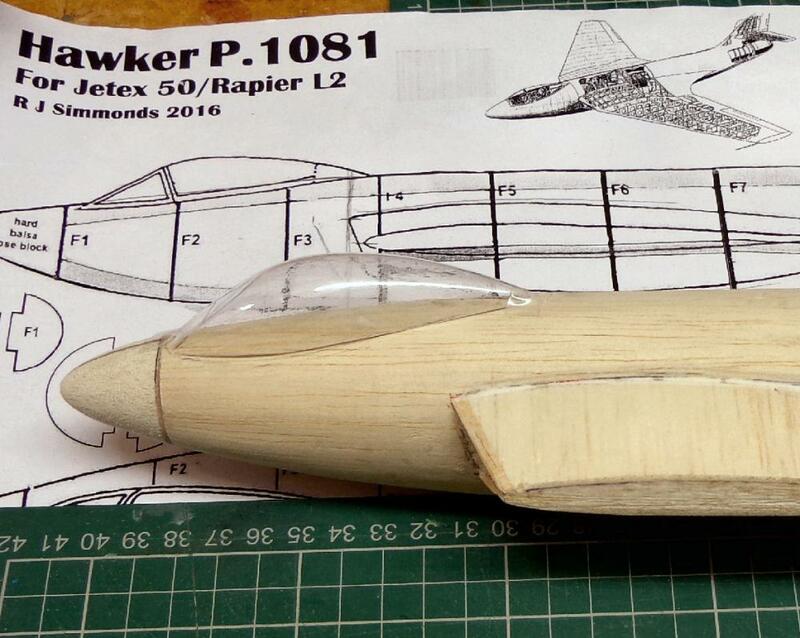 The next step is to cut out a hole in the fuselage and slot them in. Great care was taken to make sure the left and right sides match and it's all square. Above: the fuselage (at last!) nearly finished. At this point it weighs 18g and just needs the nose block, tail pipe and smoothing down. Then for the flying surfaces, not forgetting the canopy. Well, it didn't quite work out like that ... 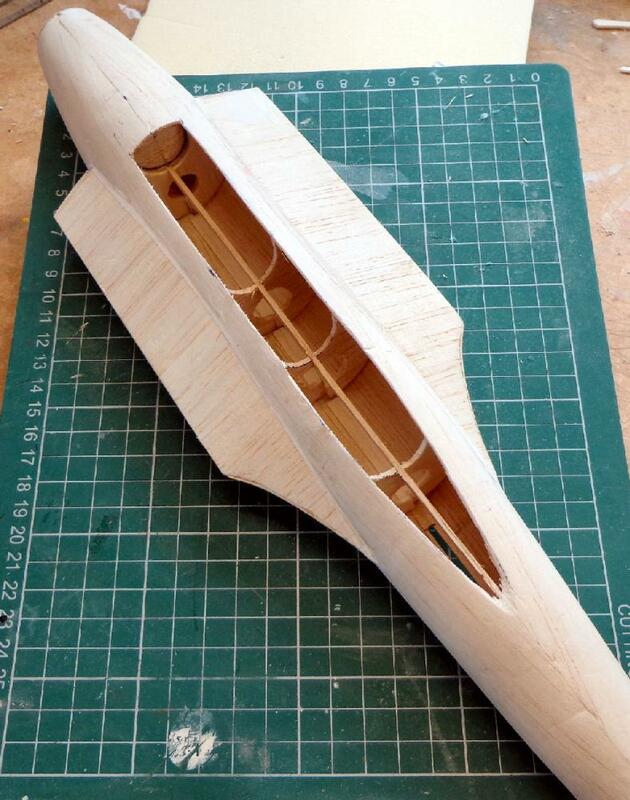 I decided to put the flying surfaces to one side and make the nose block and the canopy, both operations of which required some accurate carving of hard balsa, which doesn't come easily to me, so I'm always having to check against ply templates and using a bit of filler when I've overdone it. Above: the best I can do ... the balsa was sanded down with 280 grade 'wet and dry' and given two coats of thin laminating epoxy. After this was set hard I finished with increasing fine grades of 'wet and dry' finishing with 1200 grade and metal polish. Above: not too bad, but despite my best efforts the inner surface will need cleaning up a bit and a thin coating of acrylic glaze. 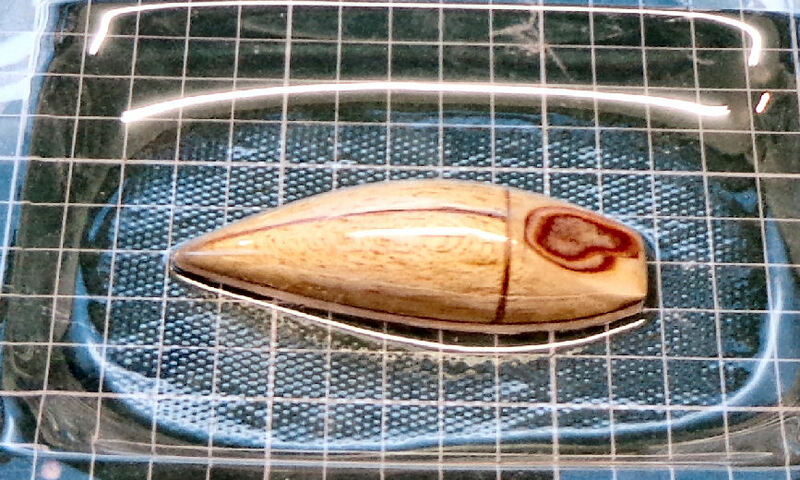 Above: here you can see the nose block, which added 2 grams or so. The accuracy (or otherwise) of the nose really does affect the whole look of the finished model, so I took a lot time over it - note the central 1/32" ply template. 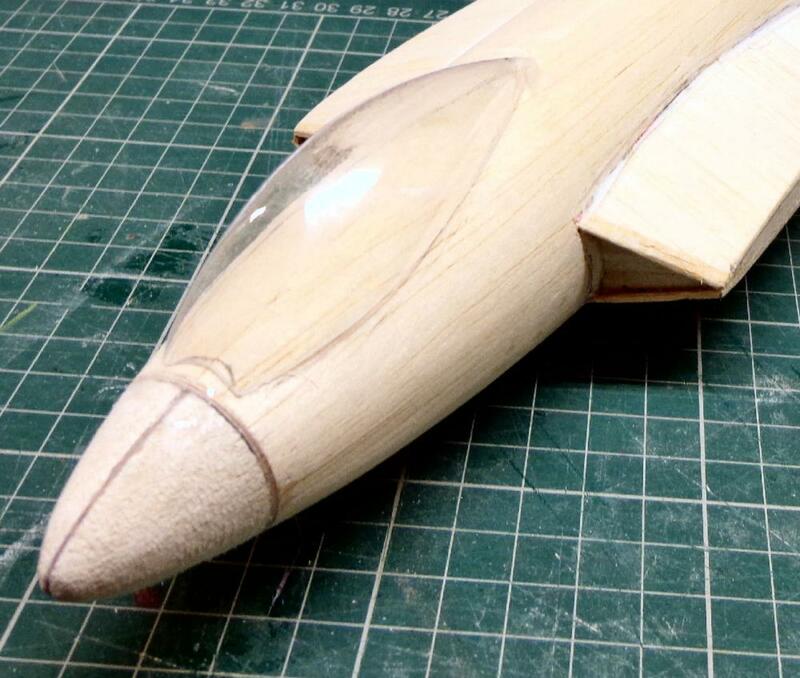 The air intakes have not yet been cut to their final shape. Progress to date: It has taken me about a month to cover and nearly finish the painting. I used Airspan synthetic tissue to cover it with a coat of Johnson's Klear to air proof the surfaces. As can be seen I use two irons and get as much tension on the covering with pieces of tape before adhering with the cooler iron of the two then using the hotter iron to put the final tension on once the perimeter is down securely. For painting I am using a Badger airbrush with Tamiya matt acylics colours thinnned slightly with Tamiya X20A thinners.The masks I'm using are cut from very thin card with a 2mm foam lining underneath to make 'stand off' masks. the edges of the foam are cut back a little from the edges to make sure there is a nice crisp paper edge to the each mask. This system produces give a nice soft edge to each colour but was much trickier to do in fact than I remembered doing it the last couple of times (years ago). I was so dissatisfied with all the 'overspray' I wiped all the acrylic paint off with cellulose thinners. The Klear also came off so I had to reapply that too. With more attention to what I was doing it eventually turned out better, but there is still some overspray which I will have to airbrush over using some of the masks as needed. 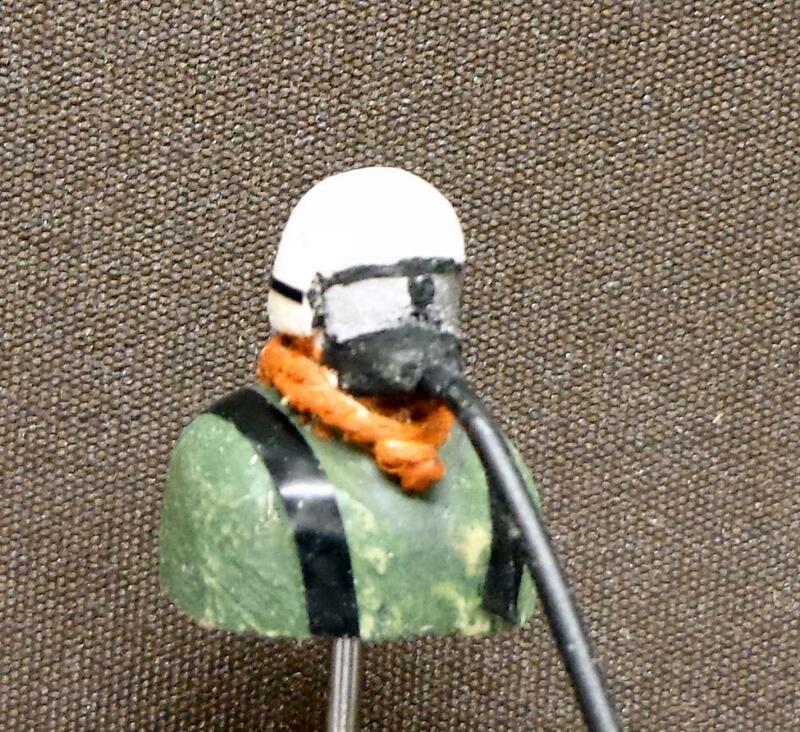 Initially, I attached the masks to the model with small pieces double sided tape but found this pulled off some of white when I was painting the mid blue so instead I used hair grips and paper clips around the edges. The last pic shows the model immediately after the masks have all been removed, it would have been much easier to airbrush with the model in pieces but the wings are securely glued in. Not much progress this week, as I got rather bogged down with the question, "does the cockpit need a pilot?" Normally my answer is "NO, we are building the aeroplane, not a toy" and I haven't made a pilot since a lady friend commented, "Oh how sweet, there's a little man in it". Now Mike Stuart thinks differently, and his jet cockpits are always occupied. The p.1081 cockpit is such a prominent feature of the aircraft I decided tochange the habit of a lifetime and make a facsimile of its legendary test pilot, 'Wimpy' Wade. I checked photos etc to make sure I'd got the scale correct and then attacked a perfectly innocent lump of balsa wood with scalpel and sandpaper, followed by paint. Carving is not my forte, but I was quite pleased with the result (paint covers a multitude of sins) and under the canopy it will look OK I think. 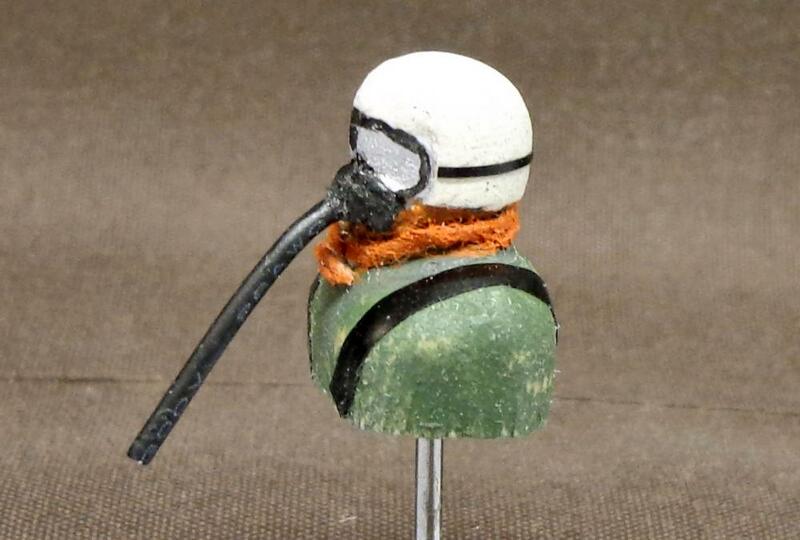 Wimpy Wade wears a cravat in the photo of him in his flying gear. This I made with a bit of string and thought red would look good. All this madness has delayed work on the wings, my next task. 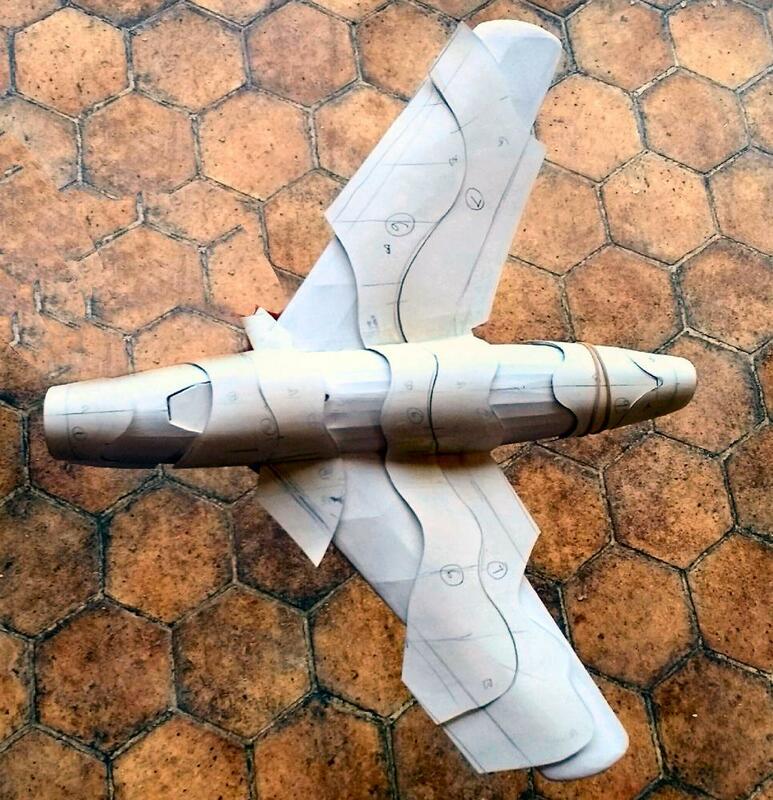 Above: the basic bits stuck together with a sanding block long enough for the whole wing and LE to be sanded to shape without any 'high spots' or waviness. The LE is medium 1/8" balsa with 1/16" hard balsa to take any hard knocks. Note the 1/32" webbing, well worth doing as it ensures the 1/16" square spars work properly. Note also the diagonal members, a little wrinkle advocated by Howard Metcalfe They add stiffness and help the built-in 1/16" washout stay in. It also protects the wing in the event of a spiralling hard arrival. 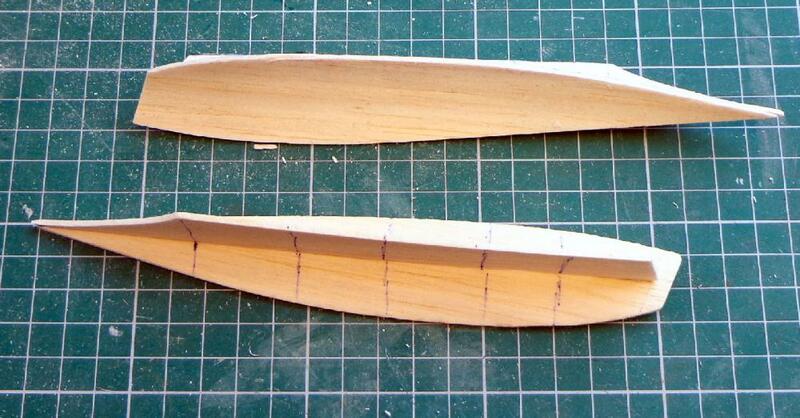 In order to help sand the correct aerofoil, I've 'tack glued' 1/32" ply templates to root and tip. I haven't kept strictly to the plan and the front spar still has to be added. I then added tip blocks and sanded everything down smooth, making sure the two wings match each other! Above: the finished wings. The templates have been removed with a touch of solvent. 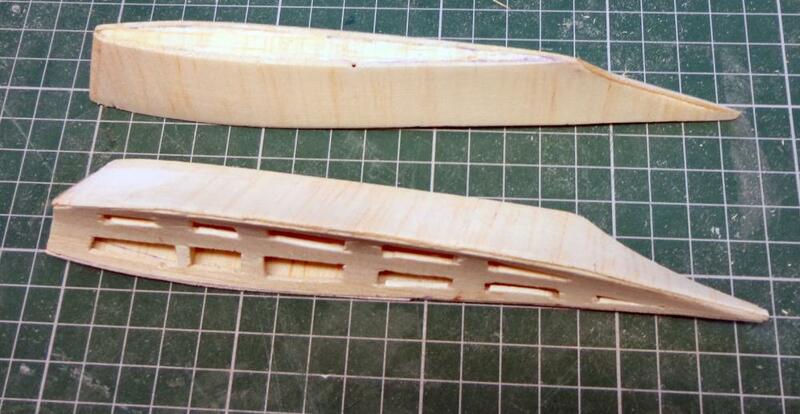 The root rib is sanded to the correct dihedral angle (give or take). The wings weigh 3 grams each - a bit heavy.